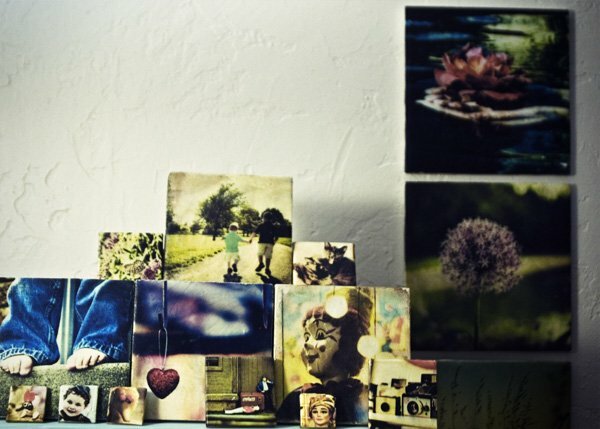 Now, you’ll want to choose photos that work well if you crop them into a square. So on your computer, pull up your photo editor (whatever you have is just fine – Picasa, Photoshop, whatev). Crop it into a square, and then resize it to the size of your tile. 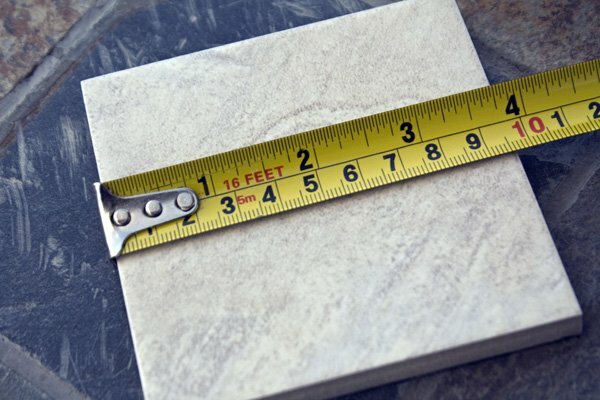 That’s right, you need to measure your tile. So in your photo editor, when you go to resize it, you choose the “size” by inches. For mine, you can see it’s just under 4 inches. I resized my photos for these tiles to exactly 4 inches (square). I always go a little over on purpose, because I’m like a monkey when it comes to cutting straight. If make the image just a little too large, I can sand it down so it’s even with the square. Also, feel free to use just regular old printer paper. The not-laser-sharp, somewhat rustic look of regular printer paper for this makes these things SO charming. So print them on printer paper (or photo paper, if you want to get all fancy). 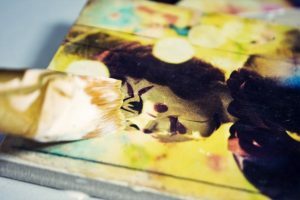 Now you have printed pictures the size of your tiles. Don’t worry about cutting straight or messing up. All will come out in the wash.
Now flip it on over and give it a healthy coating of Modge Podge all over the backside. 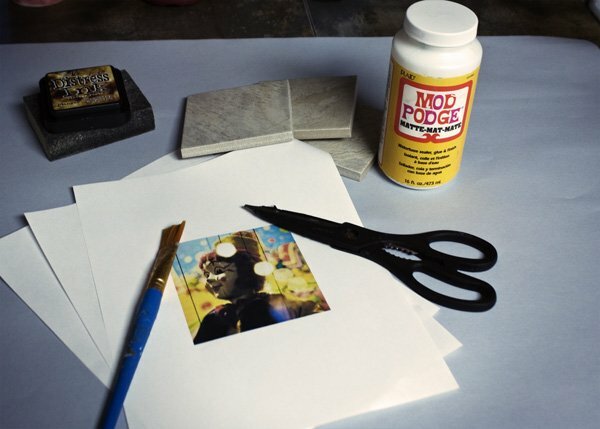 Coat it evenly throughout the back of the paper – but don’t take too long or the Modge Podge will start to dry. Once your backside is coated (hahaha), flip it over and place it onto your tile. Gently rub the paper over the tile until it’s positioned just right. Then take a straight, heavy object (like another tile or a book) and press down and pull the heavy object across the tile/picture. You are getting rid of air bubbles now. Always pull in one way, or you’ll just reposition the air bubbles all over the picture (I learned that after the 20th one). The white stuff on the picture is just dusty stuff from the tile I’m smoothing with. 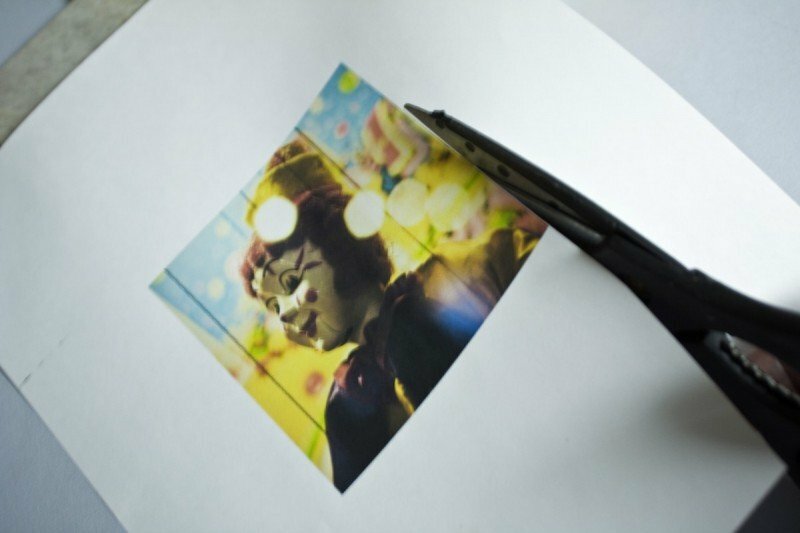 Now you want to get rid of the excess paper around the edges (unless you want to fold them down, Modge Podge them, and have your picture extend down the edges, which is fine by me). 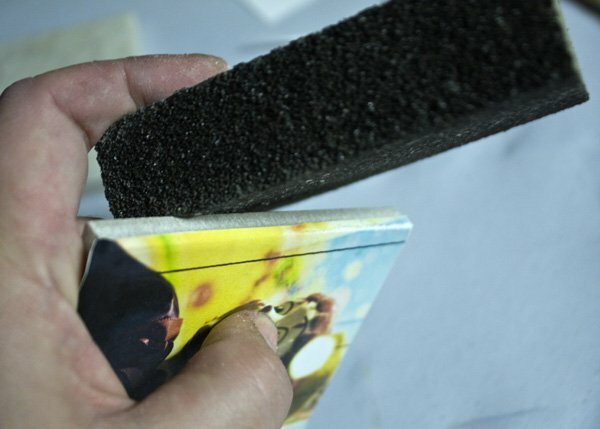 I like to use sandpaper or a little sanding block, but you could also flip over the picture tile and use a straight-edge razor blade to just shear off the extra paper. Just take your sandy device, if you’re using one, and run it firmly, in quick motions, across the edge of the picture. For some reason, I really wanted you guys to see this step. Now you just brush Modge Podge all over the front and across the sides to seal everything down and in. This is the artistic part. 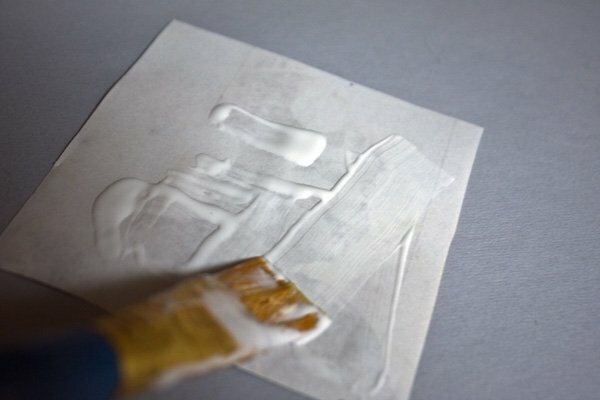 Because your ink is probably going to run just a teeny tiny bit, it will give the appearance of a painting. So use creativity when you’re brushing on the Modge Podge. I like to give little half-swirl strokes, which just enhances the painting-like feel of the finished product. Now let it dry for an hour or two. If you can wait. I could not. 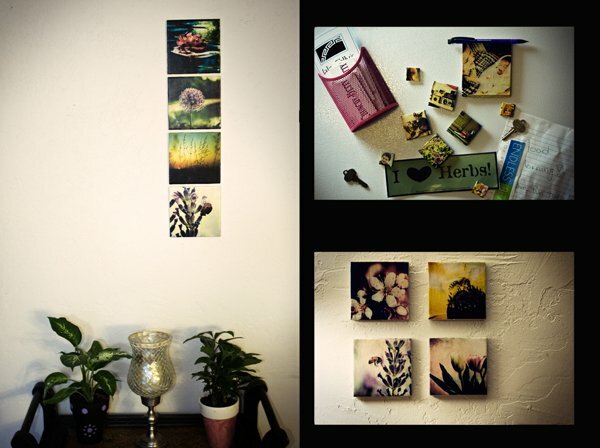 Within 20 minutes of finishing my first and second batches of picture tiles, they were on my walls. And that’s it. That is all there is to it. 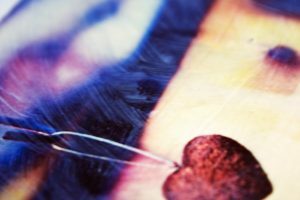 I promise you – PROMISE YOU – that if I can do this and have them turn out so incredibly well, so can you. PROMISE. I’m as good at hanging things (as you can see by my awesomely spaced picture tiles) as I am at cutting a straight line. I wasn’t really sure how to get them on, so I looked at the end of one of the aisles at Lowes and found double-sided heavy-duty sticky tape squares. And that’s how I did it. Two sticky tape squares per small tile, and three per big tile. And, of course, the stuff on the fridge just has magnets superglued to the back. You could also hang them like you might hang a plate, or I suppose you could superglue a picture hanger onto the back and use the trusty nail method.